Lots of progress has happened since my last post. 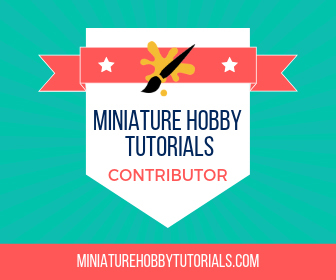 I've been focusing on the base and leaving the minis for later. 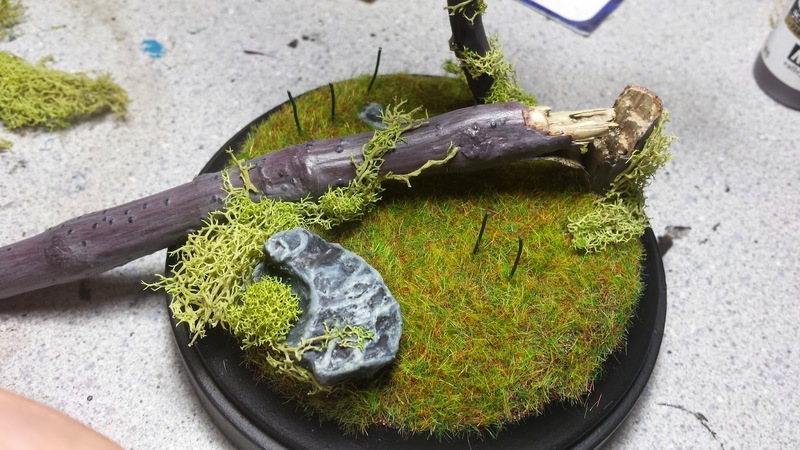 But I now have the ground, rocks and trees (including the leaves) all painted.Static Grass has been added to the ground as well as a bit more moss for ground cover. 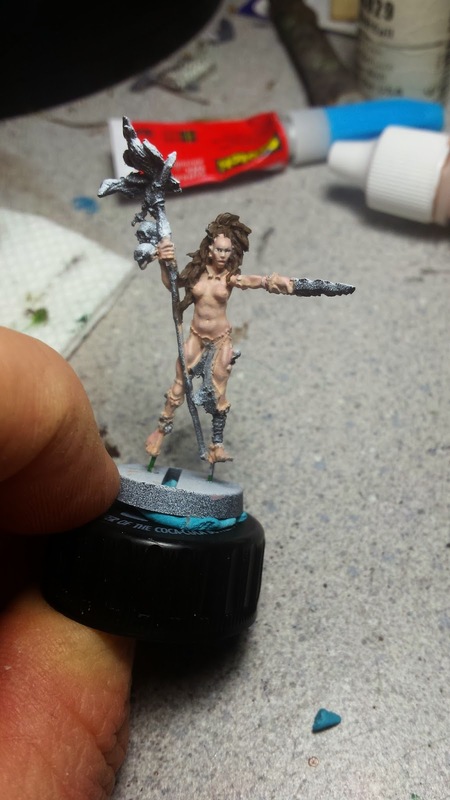 Also, I started painting the skin tones on Yrsa herself. 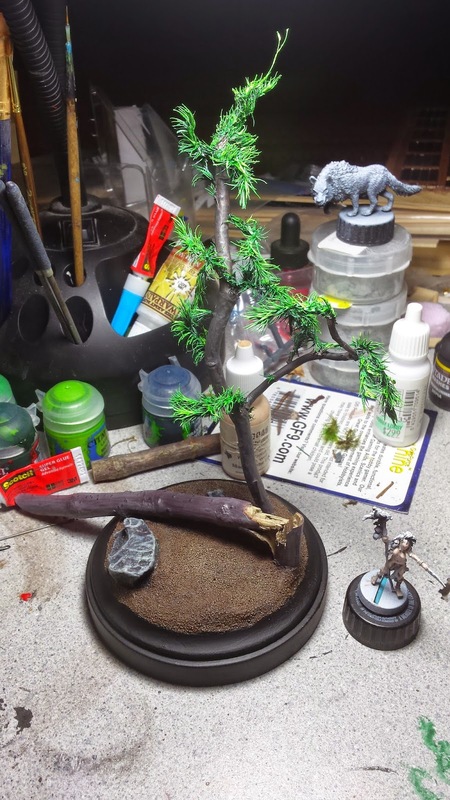 I started painting the base with the ground, painting it with a few thin coats of browns. 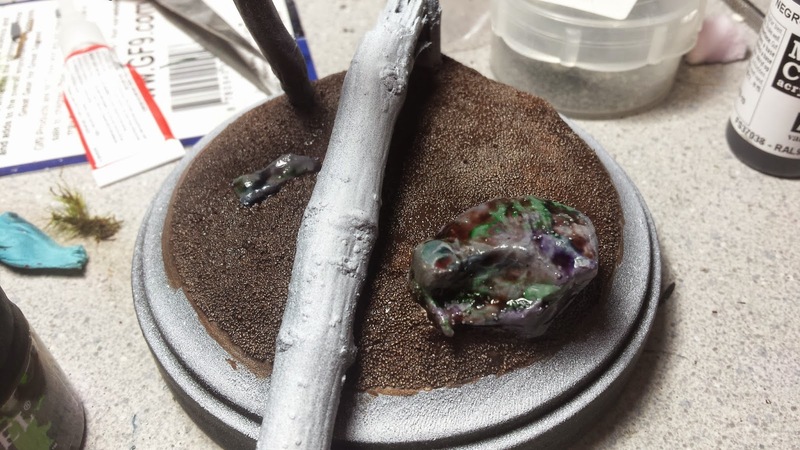 Then I moved on to the rocks and painted them like I did on Trex, which was a neutral grey, washed with various colors of ink and then drybrushed with a few different greys. painted with Chocalate Brown mixed with Red. Both trees were then painted with thin layers for grey and brown, which was applied and then wiped back with a worn out flat brush. 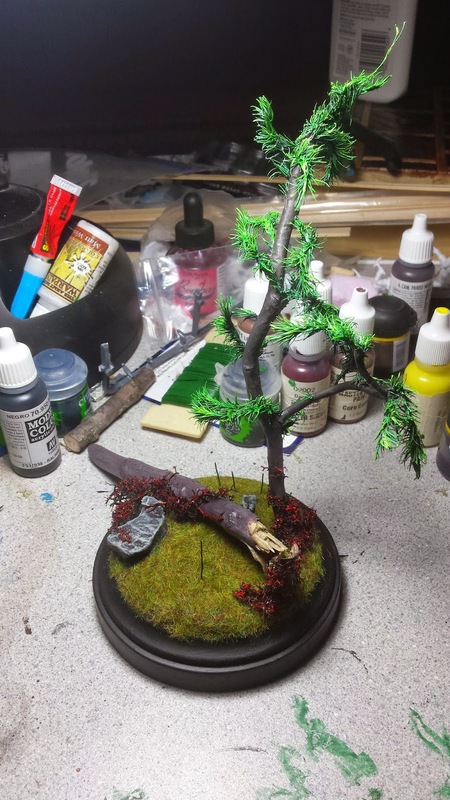 The overgrowth was applied a few days later and is another type of moss that was found in the same package as the tree moss. I started slow with it, adding a little at a time. The whole time I was worried about over doing it, but after a while I started having fun with it and added random vines coming off from it. But now I know that I need even more ground cover. I'm thinking some H/O scale flowers should do the trick nicely. I also saw some colored flocking that could be used for tiny flowers, like violets or dandelions. While the various steps of the base were drying I started on Yrsa. I began with a base coat of Reaper Tanned Highlight and then washed the entire mini with a mix of it and some GW Ogryn Flesh (reddish) and GW Drakenhof Nightshade (blue). This worked nicely, but gave her a bit of a cold look. Once the wash was dry, I started working color back in, in thin coats. I started with more Tanned Highlight and slowly added in Reaper Fair Shadow and Fair Highlight, before moving on to only Fair Highlight. This was followed by Tanned Highlight being painted back into the recesses and any area where light would be dimmer. I really like how she is turning out, but there have been a few suggestions to add a more tanned look to her, since she's naked and outdoors. I worry about doing this though and may need to think on it a bit more. For now, that's all. I need to run to the crafts store or train supply store and get more stuff for ground cover, but that'll have to wait until Saturday after work or perhaps next week, since it's Memorial Day weekend and I'll more than likely be doing yardwork the entire time. But, at least I can continue working on Yrsa and the wolf until then anyway. So that's a plus. Skitarii Battle Maniple Fully Assembled!